If you’re in a hurry, check out our top pick, Arlo Pro 2 by Netgear. 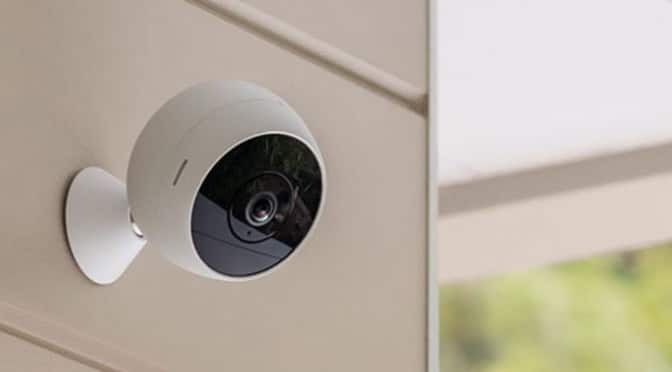 For many years, sophisticated security systems including cameras, facial recognition, and sirens were reserved for businesses or wealthy homeowners. However, thanks to the global market and companies like Amazon, tech has gotten more affordable and accessible than ever. A home security camera system is one of the best investments you can make to insure your household’s safety. However, there are many on the market ranging from affordable to high-end, with features that may not be right for every home. How do you narrow down which security camera to buy? When making a decision on which camera is right for you, there are three main areas to think about. These include practical concerns such as how the camera is powered and mounted, the specs and features of the camera itself, and additional features, perks, and controls that the system may have. The size and weight of the unit. Can you mount it securely under the eaves, over a door, or to a tree outside? Weatherproofing. Will the device stand up to extreme heat, cold, dust, ice storms, or whatever else your environment can throw at it? Power. Does the device have a battery, which you’ll have to regularly check on and replace? Can it be wired to the house’s power supply, limiting where the camera can be placed? Does it connect to solar panels, requiring an environment with enough sunlight? Or is it a device with multiple power systems, raising the price and complexity of the unit? Ease of installation. Is this something a DIY homeowner can do themselves with a few tools, or will it require the extra expense of bringing in the professionals? The camera is the star of your system, and what you’ll want to spend a lot of time looking at. 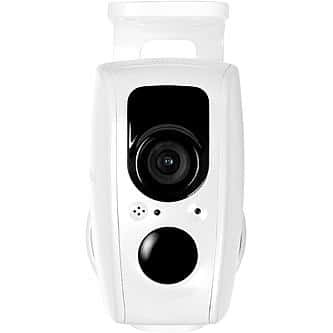 Cameras vary on a number of features including the quality of image it produces, additional functions such as night vision, and how and where the camera stores its video feed. Image quality. Budget cameras often mean sub-par image quality, but that’s not always the case. Look around and you can find some models that record in 720p or 1080p and offer broad viewing angles of 100 degrees or more. For higher-end cameras, quality is rarely an issue and 1080p is fairly standard. Night vision. Nighttime is one of the biggest areas of concern for homeowners, so naturally, you want your camera to be able to function at night. Many cameras include infrared capability. The range of the night vision varies so make sure you’re getting a useful visual distance. Where does the video feed go? Does the camera store to an SD card, which you’ll need to manually remove to transfer the data? Does it go to your smartphone, or upload to services like Dropbox? For the greatest security, you want the data to be backed up in multiple places. Another factor is how many days of footage are archived. If you aren’t happy with the number, you may be able to purchase additional storage space. Two-way communicators. 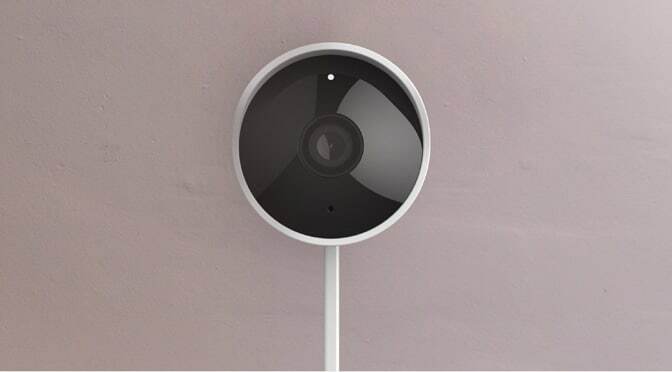 These allow the security camera to pull double duty, letting you get a look at visitors at the door and talk to them. Smartphone integration. This allows you to access video feed remotely, flash lights, sound alarms, deactivate triggered systems, and more. This may or may not require a subscription to a service. Not all cameras integrate with all kinds of smartphones (Android, IOS, and Windows) so check ahead to make sure it’s compatible. Sirens. So your camera has detected intruders or wild animals. Do you want to scare them off? A blast from a 100+ decibel siren will do the trick. Note that these sirens may violate local noise control laws, so check ahead of time before making the purchase. Lights. 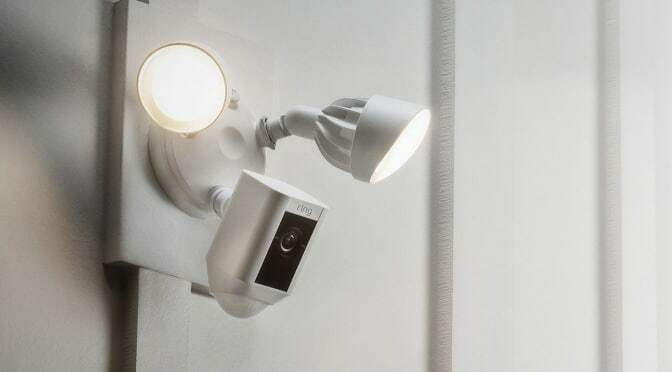 Some cameras come with motion-triggered floodlights, adding an extra level of intruder deterrent and increasing the camera’s nighttime functionality. Day in review. This feature compresses a full day’s video feed into a short (typically 5 minutes or less) preview, letting you glance over activity around your home in a time-efficient way. Multiple cameras. 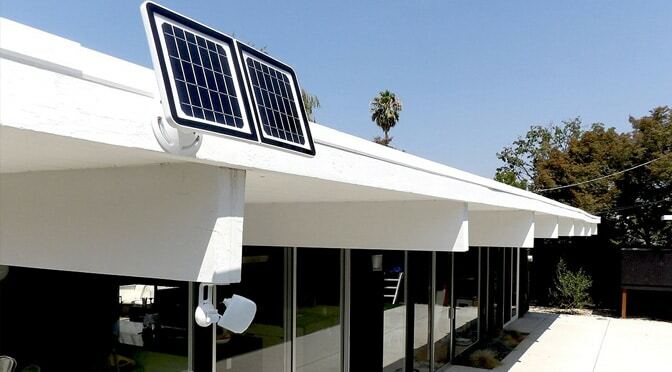 Some of the listings here are for two camera systems, which let you set up a more comprehensive web of security around your property for a reasonable price. Convenient installation in a wide variety of locations thanks to its included window mount. Two 1080p cameras with night vision and advanced motion filtering. A Smart Timelapse Day Brief, which gives you a brief highlight of the last 24 hours of recording. If you want to learn more about the Logitech Circle 2 Combo Pack, see our full writeup below in the Under $400 section. Are you looking for a budget-friendly wireless security camera that contains many of the features of more expensive models? There are a number of options out there in the affordable, double-digit price range. The sleekly designed Blink XT Home Security Camera System has many of the features of premium units without the higher price tag. This device is good for people who have basic security needs and want a unit that’s straightforward to use. 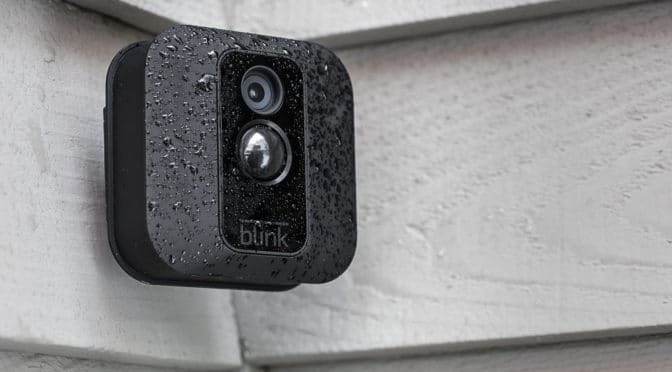 The Blink XT is fully weatherproofed for use both indoors and outdoors. 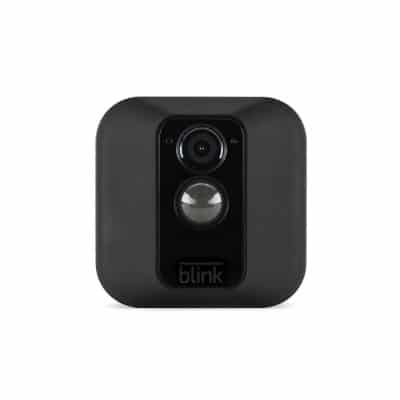 It can be connected with up to 10 other Blink units, allowing you to create a customized home security network. There’s no subscription fee, and it comes with free cloud storage for video data. Security continues 24 hours a day as this camera has a night vision function. Another great feature of the Blink is that it connects with Amazon Echo, allowing you to operate it remotely by voice. What else makes the Blink stand out? This unit runs on 2 standard AA batteries and features a two-year battery life. It connects via wi-fi to your computer, allowing easy home monitoring. This can be programmed to send an alert to your smartphone as well as provide a video feed. This unit is relatively large and not especially discreet. However, having visible security cameras can help deter some trespassers, so this is more a matter of a home owner’s security system strategy. Thanks to its ergonomic design, the Reolink Argus is suitable for indoor and outdoor use. The unit can be easily mounted on walls. It’s wireless and battery-powered, adding versatility to installation. This camera records in full 1080p, giving you superior image quality. It also features night vision capability. Another thing that sets the Reolink Argus apart is that it has a two-way microphone and speaker. This budget camera offers live streaming and connects to both Android and IOS devices. 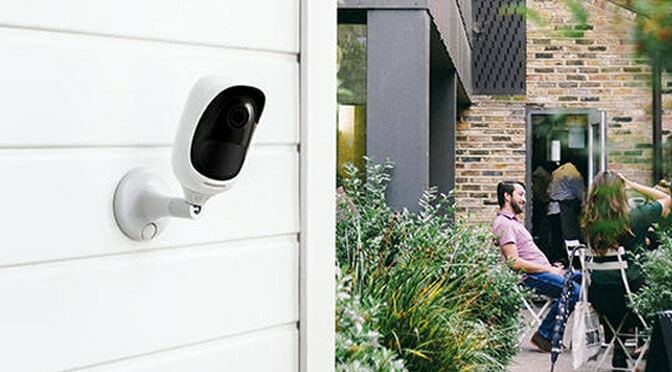 The YI Outdoor Security Camera is another fairly visible, wall-mounted unit. This security camera features a full 1080p resolution at a very reasonable price. It has a 110-degree lens and records at 20 frames per second, creating crisp security images. The YI Outdoor Security Camera includes a quality night vision function with a viewing distance of up to 50 feet. The YI also offers motion detection with programmable sensitivity and phone alerts. The cloud service is subscription-based and allows you to connect up to five devices. The YI Cloud Service offers anti-theft protection, keeping your footage securely stored on the cloud, enhancing the safety of your footage. Other smart features include real-time activity alerts, special noise recognition, and an optional hands-free intercom. The two-way microphone and speakers allow you to communicate with visitors or guests. If your budget can stretch a little more, you can find some useful features popping up for under 200 dollars. The Nest records with a high-quality lens in full 1080p and with 24-hour live streaming is sent to your phone. There’s also two-way audio and an 8x zoom. 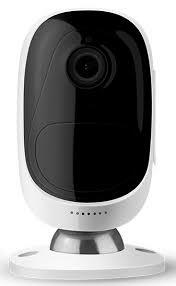 This style of camera is best used at entry points like hallways and garages or along the exterior walls of the house. One feature of the Nest that you may not have considered is that it plugs into a power source. This has both pros and cons. As a con, this will limit placement of the device. You will also need to check its connection to home power supply, and it won’t work if there’s a blackout. However, one of the advantages is that you’ll never have to worry about dead batteries. This unit also won’t turn itself off while you’re away. The Nest is certified to work with Amazon Alexa, which gives you voice control functionality. For an additional level of security, consider the Nest Aware service. This will store your video feed for up to 30 days in the cloud. The Lynx combines all of the benefits of a wired security camera with the portability of a battery operated model. It is a bulkier system and requires a suitable, sturdy place to be installed. The complete unit weighs in at 34 pounds. This camera has built-in solar panels, so you won’t have to worry about it running out of power at a bad time. Keep in mind that not every climate is a good fit for solar panel powered devices. One sunny day is required to power a week’s worth of function. You will need to judge if your area gets sufficient sunlight every seven days, year round. If the internet is down, the Lynx will store up to 3 days worth of data that can be uploaded to the cloud at a later point. Cloud storage is available for free. Data will be stored for seven days with the Tend Secure Mobile App. One feature, unusual at this price point, is the Lynx‘s facial recognition capability. This can help reduce false alarms, as well as enhance security by sending alert notifications to your phone when an unfamiliar face is detected. The Canary Flex offers a good balance of features, but shines when it comes to outdoor use. This unit is dual-powered, either wire-free or plug-in depending on your preferences. It’s compact and easy to install. The Canary Flex is ruggedly designed, especially when compared to similarly priced units. It has extremely tough weatherproofing. This camera is tested as rain-proof, snow proof, and functions from -4 to 113 degrees Fahrenheit. 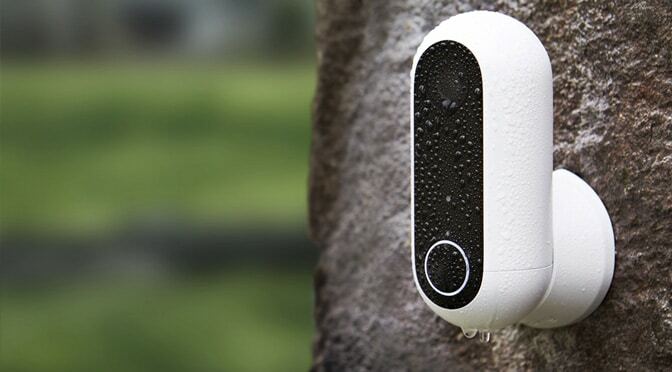 If you’re looking for motion detection, the Canary Flex features an intelligent version that sends alerts directly to your phone. This camera offers a wide variety of features including a 360-degree swiveling base. The Canary is compatible with Amazon Alexa, allowing you to stream video to Echo Show. Its night vision is operated automatically, switching on in low lighting. This is the mid-range of the price points explored here, but you can find some exceptional products at a moderate cost. This camera has recognition software that allows it detect people, animals, and cars and respond appropriately. 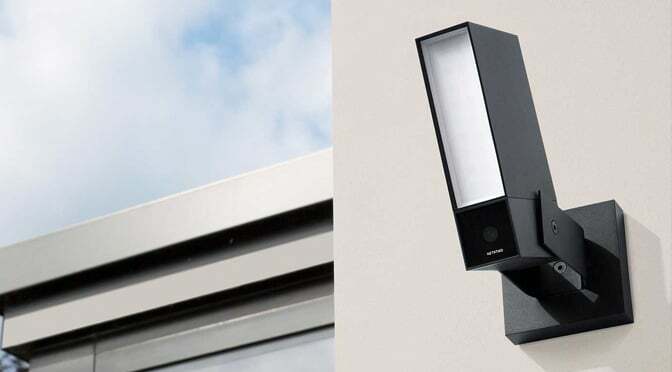 It includes an integrated floodlight that can be set to trigger in motion, frightening away intruders and wild animals as well as providing a light source. It has infrared night vision, records in 1080p, and offers a 100-degree field of view. You can stream video footage directly to your phone, letting you take a look at your property whenever you like. The Presence lets you store video feed for free on the camera’s micro SD card or, optionally, on your cloud storage account including Dropbox. You won’t need to break out the exotic tools for this since the camera is easy to DIY install and can replace an outdoor light fixture. Each unit weighs at just over 2 pounds, letting you to place it virtually anywhere you need outdoor light and security. 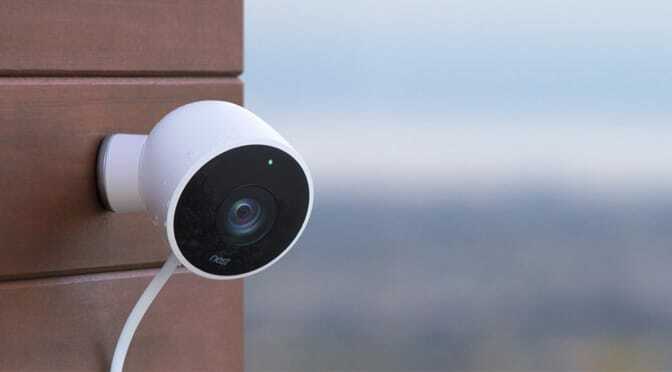 At this price range, you’re paying a little more for either higher-end features or a built-in network of security cameras. Many of these units are also smaller, tougher, or more discreet. The Logitech Circle 2 Combo Pack features two indoor/outdoor wired cameras with built-in microphones and a camera mounting accessory. These need to be connected to your home’s power supply; they are not battery only. This has the advantage of you not having to remember to change the batteries or have the cameras switch off unexpectedly. The disadvantage is that they do not function when there is a power blackout in the area. Both of these cameras are equipped with 180 degrees, 1080p lenses with night vision capability, allowing you to have a clear view of a wide area. The included window mount allows you to use a unit safely inside while still being able to see out. The mount attaches to any glass pane and can be removed without damaging it. One thing the Logitech offers that many more inexpensive cameras do not is the time-lapse day brief. This lets you see the last 24 hours of activity around or in your home, compressed into a 30-second recap. The unit also offers 24 hours of cloud storage. Upgrade to the Circle Safe Subscription Plan for a wide range of security benefits. This multipurpose unit combines virtually all the bells and whistles you might want in a security camera. It starts with an HD video feed with night vision capability but adds so much more. 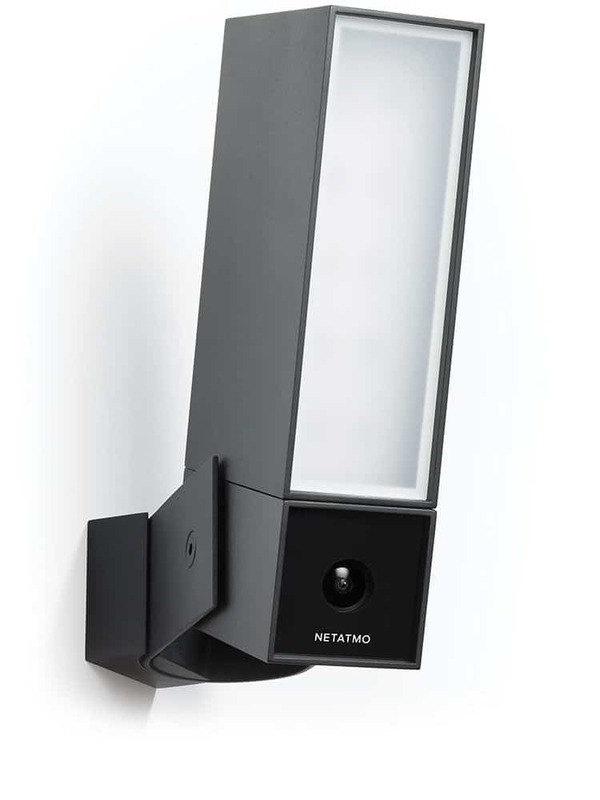 The Ring Floodlight features two ultra-bright floodlights. The 3k lumen LED lights have a wide projection area to brightly light up any area around the house where you need additional security. This floodlight is great for people who want to simplify their security strategy because they don’t need multiple devices. If those aren’t enough to insure your home’s security, the siren will. The camera’s built-in siren hits audible levels of up to 110 decibels. This can be used to scare intruders or animals off your property. 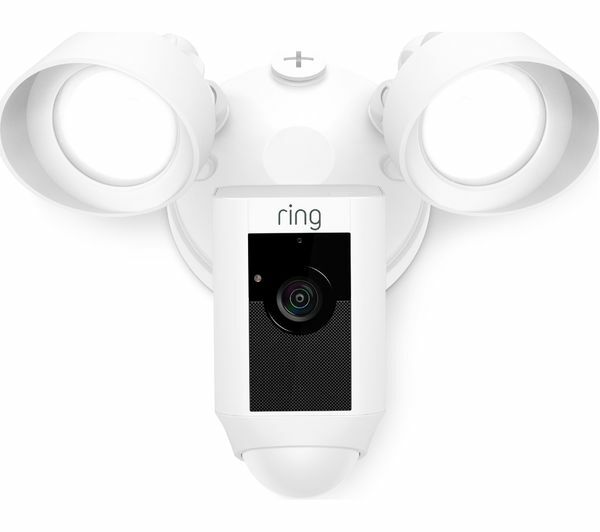 The Ring Floodlight‘s sophisticated motion detection will alert you to potential problems via phone, tablet, or PC. An optional app allows you to control the device remotely, letting you flash the light or sound the alarm. You can also command it by voice through Amazon Echo. At this price point, you will be making few if any trade-offs in your home’s defenses. Expect solidly built devices with multiple functions that will last even under difficult weather conditions. What do 500 dollars get you? A lot of features. This two camera set excels at detection, deterrence, and ease of use. 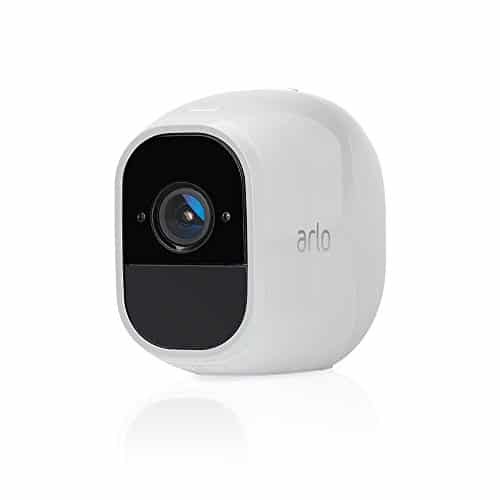 The Arlo Pro 2 has three different power options. The first is wireless for maximum ease of installation in areas distant from your house. You can also have it plugged in, making it a good option for exterior walls. Finally, you can use the Arlo Pro 2 with solar panels (sold separately). Solar panels combine the best of both worlds. However they require a certain number of sunny days to function properly. Not every home is in an environment where this is practical. You can live stream feed to your phone and receive security notifications on demand. 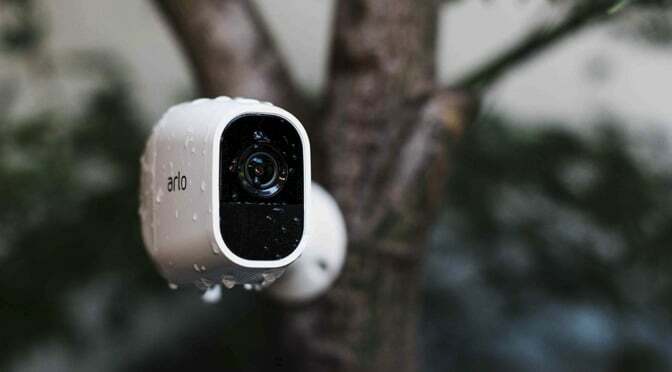 The Arlo Pro 2 also offers a 3-second look back. This lets you review what happened immediately before the alarm was triggered. Both cameras offer 1080p video with automatic night vision in low lighting conditions. They also include a robust, 100-decibel siren that triggers when an event is detected. You can control the siren through your phone via the app. Home security systems are a one-time investment that can pay off, big time, down the line. Does the right system have all the bells and whistles, from facial recognition to floodlights? Not necessarily. You’ll want cameras with solid basics: reliable, good image quality, and easy to operate. The right security system for your home, whether it’s budget-friendly or more of a splurge, will keep your house and household secure.